The Rivet system consist of a series of systems and accesories to provide attachment points to carry your gadgets. The Powerbroker we describe here is one of the many options available. The system consists of a clip (e-clip) and a pin. The powerbroker comes with the e-clip that is the foundation of the system (pictured) and several options to attach the e-clip. Included are a belt clip plate, a QR fabric plate and an adhesive plate. The e-clip is then attached to your person, backpack or similar while the pin goes attached to your gadget of choice, mp3 player, cell phone, etc. The powerbroker comes with two pins one with a small lanyard and a fixed one with adhesive. 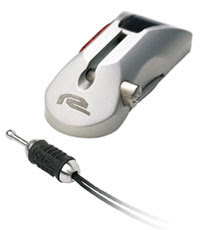 You slide the clip along the e-clip until it locks, to unlock you press a button on the side of the e-clip and then slide the clip again to release your gadget. The e-clip is small and stylish and the lanyard pin is very small and practical once locked it is quite safe. The many options for attachment and the quality of the mechanism make this accesory a good option to consider when you need a carry option for your gadget, it works specially well with smaller gadgets and scales quite well up to the size of a handheld GPS but probably not more than that. Other models from the same manufacturer are based in the same clip-pin system but have different pins and different accesories to attach the pin they are all compatible so you can buy a couple and get many different carrying options at the same time. In this particular model we can say the e-clip may be a little bulky for our taste, a small or flatish clip would have been better for a belt to avoid getting it in the way of objects as you move around. If you are used to cellphone holders this is more or less the same in size as the small ones. You can read more and check different models in the official website or order from the online store for about $18. 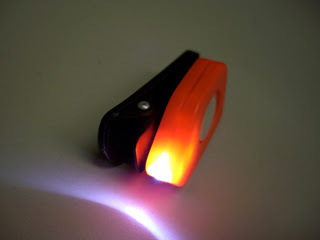 This is a very small keychain light that goes on top of a strong clip and can rotate over the clip. The light can be clipped to a baseball cap to be used as an emergency headlamp, to a belt, backpack or other places. The switch is a simple on/off operation big enough to be used with gloves. They use common coin cell lithium batteries. The lights are not very bright but have a very long runtime and that makes them useful as backup or emergency lights for tasks where an extra light may be needed or to be used as small markers when hicking or for pets. It is certainly not comparable to the Photon Freedom but can be compared to the Fauxtons with the nice extra of the rotary clip. The switch is a little unreliable without momentary operation and the case is not perfect but for the price we couldn´t expect a great finish. The lights cost $1.75 and can be obtained from CountyComm. If you want different LED colors you can buy only the light without the clip for $1 and then screw it to your clip using two small screws. The Myo XP is a headlamp featuring a 3Watt Luxeon led powered by 3 AA batteries in a rear battery compartment. The battery compartment is connected to the head by a bulky cord with a coil for expansion. The lamp can be moved vertically within a holding bezel, it comes with a flip-up diffuser lens that converts the spot beam into a very floody beam for close work, reading and indoors operation. The lamp has a battery indicator that indicates level of charge of 30% or higher, 10% and less than 10%. There are 4 output types for the LED: high, med, low and blink all activated using the switch. Next to the regular switch you can find a boost button that will give you momentary 50% additional output to the maximum beam, the boost mode will operate for 20 seconds only. The run time goes from 70 hours in high mode to 170 hours in low mode. The LED is not regulated so as the runtime increases the light will seem dimmer and the total runtime for usable light is probably a lot less than the advertised total runtime. The light is water resistant and quite solid the headband does not have an extra strap to go above the head so it may be a little unconfortable if you are used to other headlamps with more support. 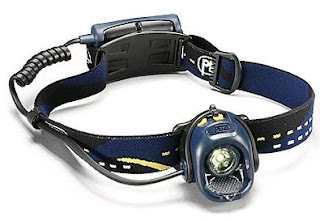 It is a very bright headlamp with useful lower levels for long runtime and a difuser filter for close work and reading. You can read more in Petzl's website or order from REI for $70.